Aldous Tightwad, Senior Managing Partner, Tightwad and Curmudgeonly LLP, Solicitors. Thank you for your suggestion. I can assure you that I am always looking for suitable advertising opportunities to attract clients of all genders provided, of course, that they are of sufficient means to pay my fees. Meanwhile, if Mr Curmudgeonly should require any advice then I shall, of course, be happy to assist - I have no concerns about his means. if so it wasn't a man; you may be the short-sighted owner of a dog. You are, of course, correct. However, as we know, women are delusional creatures - the important thing is not whether he was romantic, but rather whether she thought he was. Stay confused, SW - it's better that way. ... or the reasonable delusional woman...? yep; staying confused is definitely the option. and one that has served me well enough for many years. 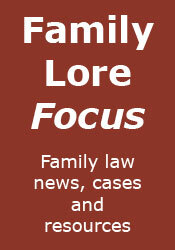 Is there a future for family lawyers?